In a world where most of the new breed of headliners made their reputation on what they can do on their Mac in the studio rather than what they can do in a club, it’s refreshing to find a producer who has paid her dues on the way to becoming one the most exciting producers her country has given us. D’Steph has a serious DJ CV with residencies at some of Belgium’s biggest and most legendary clubs. As well as her resident slots at clubs like Café D’Anvers and Club Geluk she has been a regular fixture behind the decks at the legendary FUSE, Kissinger and Petrol clubs and rocked the stage at massive festivals like Pukkelpop, I Love Techno and Ten days Off. Her production CV is not too shabby either with releases on Solar Kollektiv in Germany and Chez in the US as well as on Jalapeno who have recently signed her up to do an album for them. The first of her new material came out at the end of 2011 in the shape of ragga bass bomb ‘Rude Gal’ which also had killer re-rubs from Parker and RackNRuin. In early 2012 she dropped a duo of deep house floor slayers, ‘With You’ featuring the vocals of long time collaborator Melissa and ‘Cause Rhythm Is Love’. 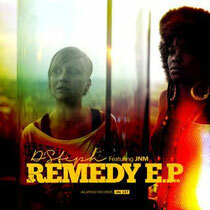 Now she is back with her ‘Remedy EP’, which again features her live MC JNM aka The Naked MC on title track ‘Remedy’. Second track is ‘Lack Of Love’, a collaboration with Belgian singers Vox & Jacks and third track is ‘Getting It On’. Out 30th April. Grab the free download of her track ‘Rude Gal’ below.